Did you know that Whole Foods has a magical machine that takes ordinary shelled pistachios and turns them into creamy foodie heaven (i.e. pistachio butter)?? Yes, they really do. Ok, so we’re a bit new to this phenomenon but let us try to convert you too. 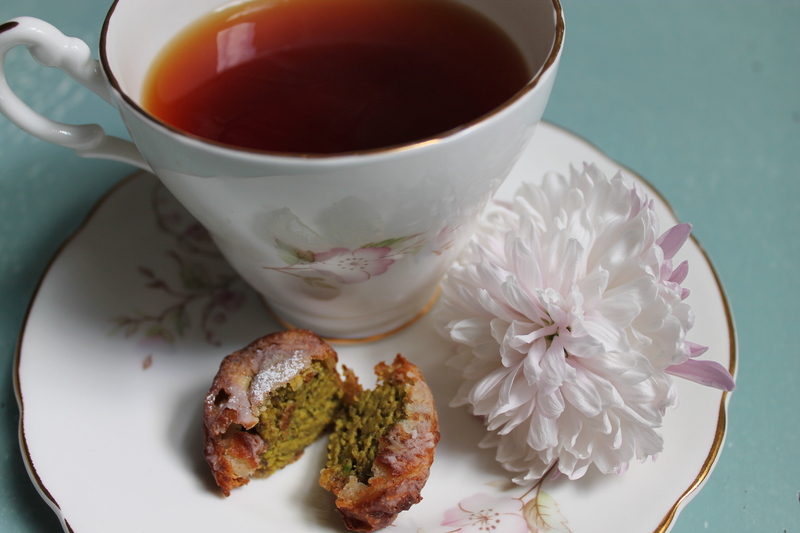 Pistachio butter is creamy, a bit savoury, a bit sweet, with a wonderful depth of flavour. You can use it in pretty much any way you’d use peanut butter or other nut butters – we toyed with sandwiching cookies with it, swirling it into cake, spreading it onto steak or even using it as a dipping sauce. Once you try it, you’ll wonder how you totally missed the boat on this one (hehe.) Admittedly, it’s not the cheapest nut butter but a little goes a long way. So today, we were having our regular doughnut craving (WHAT? YOU TOO?!) and wondered how we could work in the pistachio butter. And because we were feeling fancy, we thought we’d call them something French! 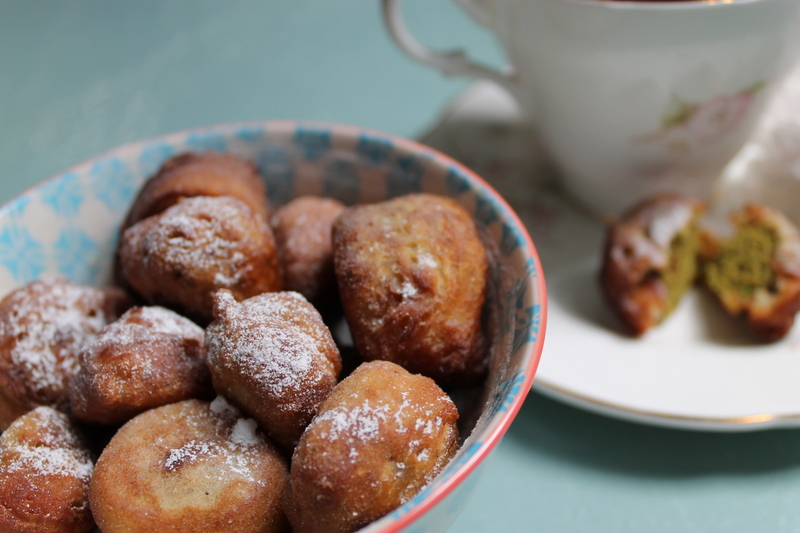 We first and last made beignets in French class in high school and they were wonderful! Fluffy and delicious little New Orleans doughnuts sprinkled with icing sugar…yums. We also added cardamom to add our little Indian twist to the whole thing. And the result – super yums! Let’s do this! Mix the ground flax seed with 1 tbsp of water in a bowl. Stir in the remaining water and milk to the mixture. Slowly add the flour, baking powder, salt, sugar and ground cardamom, stirring all the time. If there are lumps, give the mixture a good whisking. Refrigerate the mixture for about an hour until thickened. 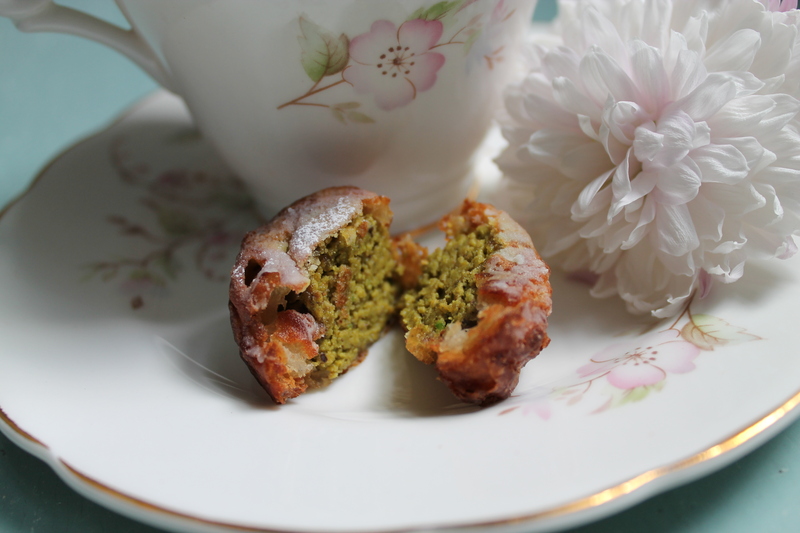 Using a teaspoon, shape the pistachio butter into balls and drop into the mixture, making sure each ball is well coated. Heat the oil in a large saucepan until it is hot enough so that a small amount of mixture browns within 30 seconds. Carefully drop the balls into the hot oil (we used a long sundae spoon to do this), making sure there is space between each one. Fry the balls until all sides are golden brown – this took us about 30 seconds each ball. When done, place the balls on a plate lined with kitchen paper. You may need to do this in batches. If necessary, dab the balls to remove the excess oil. Sprinkle with icing sugar and enjoy immediately. If placed in the fridge, this can be eaten within 2 days. Drooling…! I really love this post and your blog!!!! !